“We were not overly surprised to learn that children with disability are more vulnerable to bullying, because of a lower self-esteem, sometimes differences in appearance or because they have special needs,” said lead author Mariane Sentenac, of the University Paul Sabatier in Toulouse, France. The study showed that students who reported having a disability or chronic illness — no matter where they lived — were more likely to be bullied by peers than those who did not. For instance, in France, 41 percent of boys with a disability or chronic illness reported being bullied compared with 32 percent of boys without. Gender, however, was not a factor in being bullied — both boys and girls were equally victimized. Mark Schuster, M.D., professor of pediatrics at Children’s Hospital Boston and Harvard Medical School, said that bullying of children with disabilities is a definite problem in the United States as well. “Unfortunately, children who stand out in any way, because of their health, their race, their orientation, or anything else that distinguishes them from most kids in a school, can find themselves a target of bullying,” Schuster said. “In my view, good relations with teachers and parents could play an important role in preventing and detecting bullying behaviors between students because they are in a position to observe two different aspects of the adolescent’s life,” Sentenac said. I am the webmaster for connected Kansas kids. One of the issues we try to deal with is the problem of bullying behavior. 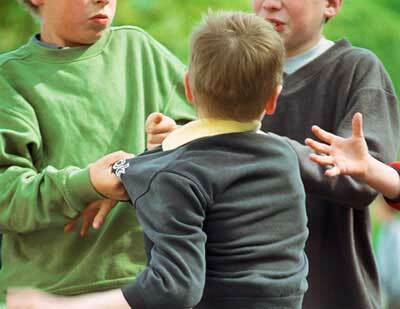 Your picture “bullying-kids1.jpg” would make an excellent addition to our site, and that of the University of Kansas Center for Telemedicine & Telehealth. Could we have permission to use that picture for patient and parent educationpurposes?